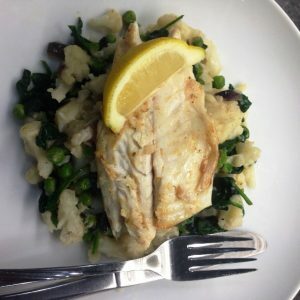 A light and zingy dish using Jethro’s Lime Chilli & Oregano Marinade, enhancing the natural flavour of the Sea Bass, with the spiced cauliflower creating an extremely nutritious dish. Ideal on its own, or for a fuller meal, try serving with potato wedges or chunky chips. Bring a pan of water to the boil and add the cauliflower florets. Cook for 5 minutes, and drain. Leave to cool. Heat half the coconut oil in a large frying pan and add the onion and fry for 2 minutes. Add the peas and 1-2 tbsp of Lime Chilli Marinade, after 2 minutes add the spinach and cook until wilted. Add in the Cauliflower and warm through. Heat the remaining coconut oil in a separate frying pan and add the Sea Bass skin side down. Drizzle 1 tbsp of Lime Chilli Marinade over the fish. Cook for 2 minutes until skin starts to go crisp, then flip the fish over, and continue to fry for 2 minutes until cooked.